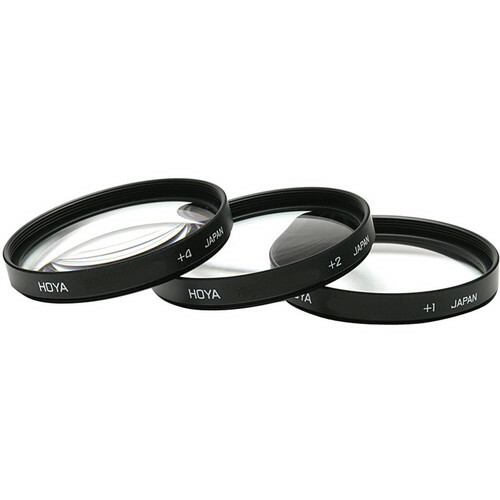 The 77mm Close-up Filter Kit from Hoya is a set of three filters designed for close-up photography. Each filter has a power of +1, +2, or +4, and can be used separately or in combination to photograph small objects such as flowers and insects at a close range. Close-up filters allow you to get closer to the subject. With close-up filters depth of field tends to be very shallow and it is recommended to shoot with smaller apertures for greater focus. These filters use Hoya Multi-Coated (HMC) technology to reduce flare and ghosting while maintaining an average light transmission of 97%. The ring is made of aluminum with a threaded front so the filters can be combined. Box Dimensions (LxWxH) 9.4 x 4.6 x 1.3"
77mm Close-Up Filter Kit (+1,+2,+4) is rated 4.4 out of 5 by 14. Rated 4 out of 5 by stakee from Great accessory for stock photo I bought this to do close up/macro photography using my 70-200mm F2.8 lens. Considering how much macro lenses cost, this was a cheap & good alternative. If you are using the same lens, be sure not to zoom out, since it seems to add unwanted blurriness. I usually shoot between 100-130 range to get deeper dof, combining multiple shots with varying focus in Photoshop to get a better result. Stacking filters is a no brainer once you look through the finder, just remember that changing focus on the lens itself will alter the zoom range. If you are shooting indoors, I recommend to get a decent flash kit (ring light or cheap flash heads/adaptor, or Alien Bees with soft box). Rated 4 out of 5 by Jaxunk from 77mm Close-up Kit (+1,+2,+4) by Hoya High Quality glass and well manufactured as you would expect from Hoya. Nice carry case for quick and easy install and removal. However, I was not able to get the +4 filter to work on my 28-300 lens at all. Rated 5 out of 5 by Anonymous from A great product for macro photography. Whether you are looking to do macro photography at a low cost or, dont want to fork out cash for a macro specific lens or want some flexibility in the field for macro shooting that wont add much weight to your pack this is a great solution to all. You can achieve some great macro photos with these lenses at a cost that wont break the bank. The 4X is good for most insect/flower work. I tried it out on a spider that was about 1/100 the size of a sunflower seed combining all 3 lense combos and was able to still make out some great detail even though the spider was basically the size of an aphid and he was a bit camera shy and was bouncing on his web. With all 3 lenses combined you will have very little DOF. The only downside I can see is limited DOF but well then you should expect that if placing bifocals on a 200mm zoom lense. I think it adds character to the photos when you lose a focus plane and if you slow down and take your time you will get some great photos. Rated 5 out of 5 by Becci from Magnified! I got these for doing wedding ring and sentimental item shots at weddings but I have been having so much fun with these. I've used them at my lat newborn session for baby details then I took them to our local gardens and got such great shots! Totally worth it! The bokeh on the images were beautiful, the quality is fantastic. Rated 3 out of 5 by WELLTRIED from WORKS AS ADVERTISED BOUGHT FOR USE ON A CANON L LENSE FOR CLOSEUP WORK IN PHOTO/NEGATIVE/SLIDE DIGITIZATION (DAM). IT DOES WHAT I NEED IT TO DO IN GETTING CLOSE, BUT THE EXTRA GLASS DOES DARKEN THE END PRODUCT SOME. I AM USING THE SETUP FOR MY FAMILY STUFF, NOT PRO, SO I'M A HAPPY CAMPER. I HAD HOYA DIOPTERS AND FILTERS ON MY FILM AE1 PROGRAM BACK IN THE '90's, AND TRUST THE BRAND. WORD TO THE WISE, DON'T OVERTIGHTEN!! THE ALUMINUM THREADS CAN BIND VERY EASILY AND HARD AT LARGER DIAMETERS. Rated 4 out of 5 by Al from I like these better than extension tubes Good for macro work. Allows me to get within 4 of the object photographed. The +4 lens allows a 1 to 1.5 magnification ratio on my 300mm lens. I couldn't see any degradation of my image quality. Rated 5 out of 5 by Robert from Does as advertised Thought that I would experiment with this before I bought a macro lens. The kit does very well and will do just fine until I can decide if the bigger lens will get used much.